A fun and safe way to bring STEM-based learning into the classroom. STEM-based activities guide students through the culturing and presumptive identification of common microbes on innovative BioPaddles® each containing microbe specific media enclosed in a sterile vial. Students apply science, technology, engineering, and math concepts to the exploration of microbes that they encounter everyday. Activities to develop critical thinking skills and emphasize engineering as a key component. 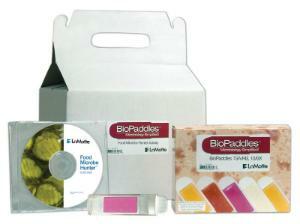 Each Microbe Hunter includes a CD, 10 BioPaddles to perform the first two activities, and 10 magnifying lenses. Additional paddles may be purchased to perform the additional main activities, STEM extension activities and Going Further activities. Soil Microbe Hunter - Students research the process of soil formation soil characteristics, and the influence of environmental conditions on soil microbe populations. Milk Microbe Hunter - Students identify and explore microbes cultured from popular dairy products like milk, yogurt, and Kefir. Teams design a monitoring method to determine when a dairy product is spoiled. Air Microbe Hunter - Students predict when environmental conditions are favorable to microbes and then propose and carry out a strategy to collect airborne microbes using passive sampling techniques. Food Microbe Hunter - Students determine what factors affect the microbe growth in food by designing experiments to control intrinsic and extrinsic factors, predict the probability of microbe growth on food, and design an experiment to prove their hypothesis about the preservative effect of pickling.